Jack Taylor’s Alexandria Toyota is one of four dealerships nationwide that has received Toyota’s coveted President’s Award 29 years in a row including winning it again in 2015. Our service team has hundreds of years of Service experience while winning 13 years of Service Excellence awards. Also, our Parts Department is a consistent winner of the Toyota Parts Excellence Award recognizing the premier standard in Toyota service. Why Service at Jack Taylor’s Alexandria Toyota? Active role in maintaining your vehicle will help you protect this investment. Proper maintenance will help extend the life of your Toyota or Scion and preserve its value. 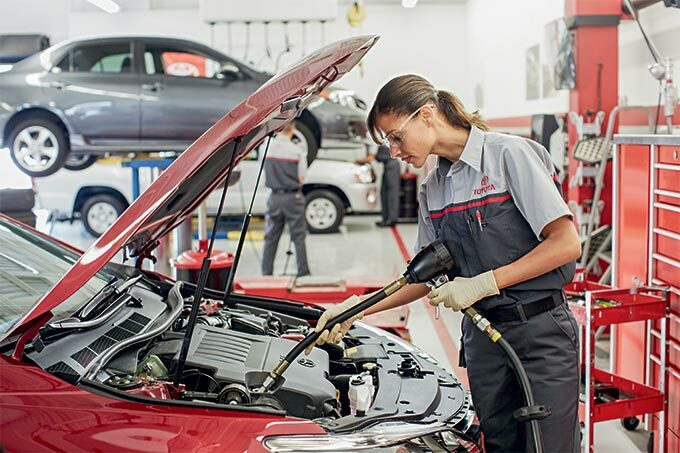 In addition to helping you avoid costly repairs down the road, regular maintenance will optimize your Toyota or Scion’s performance, safety and fuel efficiency. Our service includes complimentary shuttle service to and from the Crystal City Metro. We offer Rental Cars, Loaner Cars, TRAC/Toyota Rent a Car service, too. After purchase, please attend one of our New Owner Clinics where you learn more about the ToyotaCare and Scion Service Boost complimentary maintenance programs. Find your Toyota or Scion scrapers, aluminum wheels, hats or accessories in our Retail Parts Area. We can even provide aftermarket accessories to dress up your ride. For the Do It Yourself (DIY) crowd, please purchase your oil filter, windshield wiper fluid, wipers, batteries, air filter, brake pads, floor mats, vent visors and Genuine Toyota and Scion Parts at our Parts Counter. Don’t forget, every year to return for your annual Virginia state inspection. We’ve created space for your children to enjoy their time while your vehicle is serviced. Check out our Children’s Play Area. Our Detail Center will help keep your Toyota or Scion looking great with full detail services, buffing, waxing, vacuum and hand wash services. Optional cleaning includes wipe down the dash, dress tires, window cleaning, shampoo carpets, glaze application, sap and tar removal, engine cleaning and vinyl/leather cleaning. Toyota and Scion Tire and Wheel, Full detail service, buffing, waxing, accept Road Hazard, ExtraCare, TCUV, Detail Center, complimentary car wash, MPI, alignment check on every vehicle, WiFi lounge, refreshments, coffee, convenient online schedule and a drive-through climate controlled service lane. Although Toyota and Scion vehicles are known for their exceptional quality and reliability, we are always here to provide you with expert service and advice. There is nothing more important than a competent Technician. One of the dealers’ biggest assets is our Factory Trained Technicians using the latest digital technology to diagnose and repair your vehicle using only genuine OEM Toyota and Scion replacement parts. 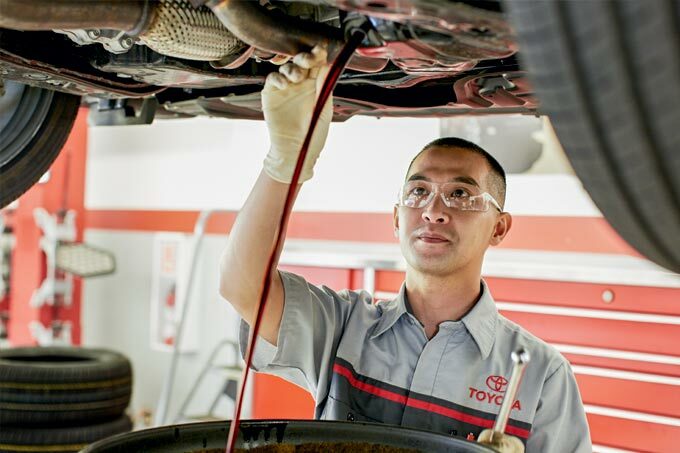 The Toyota Technician Certification program requires completion of Toyota’s specialized, state-of-the-art training as well as rigorous exams through both Toyota and the National Institute for Automotive Service Excellence (ASE). We have an ongoing training program for the service staff, which includes not only the service technicians but also the service manager, advisors and support staff. We can handle warranty repairs on all Toyota and Scion vehicles, most importantly, at no charge to the customer. Our technicians specialize in transmission and engine services. Jack Taylor’s Alexandria Toyota’s Award Winning Team Is At Your Service! At Jack Taylor’s Alexandria Toyota, we’re proud that our Service Department is a perennial winner of Toyota’s coveted “Service Excellence Award,” the honest honor a Toyota Service department can achieve. In addition to passing the rigorous Toyota Certification Program, many of our technicians are also certified by the National Institute for Automotive Service Excellence (ASE). They are skilled in the use state-of-the-art equipment and tools designed specifically for your Toyota, and they use genuine Toyota Parts designed to keep your vehicle working at optimum performance levels. After we’ve worked so hard to earn your business, we intend to keep it. So, we’ve built an automotive service division that our customers consider second-to-none. In addition to passing the rigorous Toyota Certification Program, many of our technicians are also certified by the National Institute for Automotive Service Excellence (ASE) and they use state-of-the-art equipment and tools designed especially for your Toyota or Scion as well as genuine Toyota and Scion Parts that are designed to keep your vehicle working at Toyota or Scion’s high-quality levels. We make servicing easy with 15 ASM work stations and 50 service bays. The most important thing you can do to keep your Toyota or Scion running well is to change the engine oil on schedule. Inspect your brakes at regular intervals according to your Toyota or Scion’s recommended maintenance schedules. Keep an eye on tire pressure – losing just a few pounds of pressure in your tires can hurt fuel economy and shorten tire life significantly. Read your Toyota or Scion Owner’s Manual. It will tell you everything you need to know about your vehicle. Today’s sophisticated engines require a lubricant designed specifically for improved engine performance, increased fuel efficiency and reduced engine wear. Many Toyota models are certified for a new zero-weight synthetic lubrication standard (SAE 0W-20). Our 0W-20 oil is low-viscosity synthetic oil formulated to provide uniform lubrication and reduce friction throughout the engine. Lighter than conventional engine oil, 0W-20 evenly and uniformly bathes your engine’s moving parts, which means less wear and tear, better thermal stability and increased engine efficiency. Jack Taylor’s Alexandria Toyota is a distributor of Factory-Certified Toyota Parts and Accessories. Genuine or “OEM” Toyota parts are specifically designed to provide the safety and service life you expect from Toyota. Genuine Toyota Parts – Don’t settle for less. For online accessory orders, please order through buyatoyota.com. Do you need a dent or ding fixed? We offer collision center and body shop services. Simply call or ask an advisor. As a STAR Elite wholesale parts dealer, our drivers will provide complimentary delivery, complimentary online parts look-up and ordering service. You can order over 9,000 parts from Alexandria Toyota after registering online. Simply select model, year, parts category and part. You can save your Frequently Ordered Parts, save your search if you need to come back later and finalize the purchase. Feel free to use the Add to Cart service, too. Upon placing your order, feel free to provide specific delivery/arrival instructions and will accommodate your request. Your MyParts account will provide access to important and updated technical guides and resources to ensure proper parts ordering. The system provides an electronic part ordering catalog with easy online instructions and the Toyota Information System (TIS) for proper repair instructions.